Many of you living along the coasts of Florida have seen posters going up advertising an upcoming Lionfish derby. You may be scratching your head and trying to remember if the fish you saw at the aquarium many years ago or at the local pet shop is the same lionfish, and although it may be hard to believe it probably is! 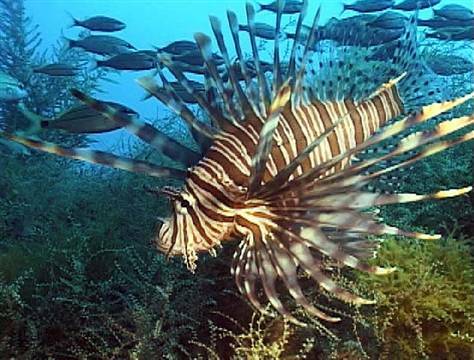 In fact the Lionfish has become so abundant in Florida’s (and many other areas around the east and gulf coasts) waters that competitions are being held to collect, spear or net as many lionfish as possible in hopes of reducing the numbers of this invasive species. The Lionfish many divers and snorkelers are encountering are the descendants of fish that may have been introduced to these waters by those releasing fish that may have been part of their aquarium or pet shop owners getting rid of their stock. But it seems that over time these fish began to reproduce at an alarming rate. In fact this fish native to the Indo pacific region can produce over 25,000 eggs every four days! Although sightings of Lionfish in Florida have been documented for decades it wasn’t until around 2009 when a massive surge in their population was noticed and this expansion was not limited to Florida. Most sightings occur around structure such as reefs and wrecks and can survive in extremely shallow water of only a few feet and have also been found in depths approaching 1,000 feet. Because they can survive in waters with a temperature range of 50 to 90 degrees they can be found in waters from Brazil all the way up to the mid Atlantic seaboard of the United States and throughout the Gulf of Mexico as well. Although not poisonous as many people may think, they do possess as many as 18 venomous spines that can inflict and extremely painful puncture. These spines are extremely sharp and are used primarily for defensive purposes. The biggest concern is not their venomous spines but their voracious consumption of native species, especially the juvenile fish and crustaceans that are a vital part of the health of the reef eco-system. Combine this with the fact that our native species are already strained to the point of noticeable decline and there is reason to worry. A strange by-product of the war on lionfish is that many seafood restaurants have added Lionfish to the menu. The venom found in the spines is not found in the flaky white meat and those who eat Lionfish have compared is mild flavor to that of other favorites such as Snapper and Flounder. Just be careful during preparation, as the spines of a dead Lionfish are still capable of envenomation. So next time you see a poster for an upcoming Lionfish derby, think about eating Lionfish at a local restaurant and do your part to curtail the Lionfish invasion! 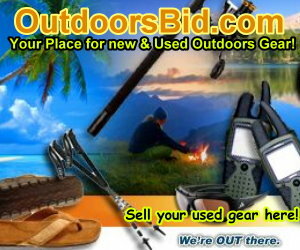 » Conservation, Featured Content, Fish & Wildlife » Florida’s Lionfish Invasion! 2 Responses to Florida’s Lionfish Invasion! 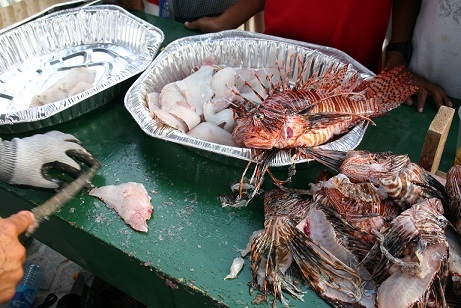 Has anyone actually tasted Lionfish meat? I saw them on a menu in the Florida Keys but was too nervous to try it! I actually have tried it and it really good. A very flaky and sweet white meat. But the real fun is actually catching them!